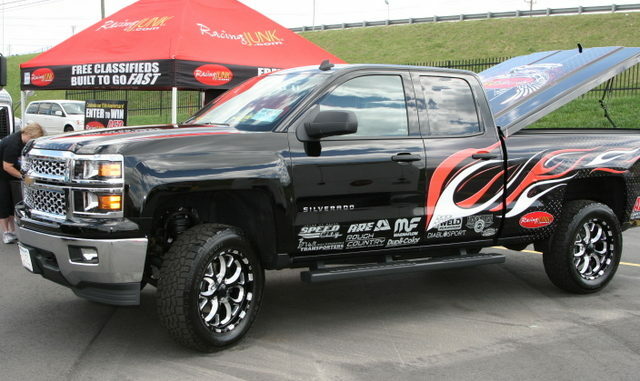 Modding the 2014 Chevrolet Silverado which RacingJunk.com and AED Performance will be giving away this fall is a little like dressing up your best friend as a teenager. You get to choose the coolest stuff, you get to see the effects of the transformation in action, and take credit for those choices, but ultimately, someone else gets to enjoy the full force of those upgrades. Fortunately, for us, we get to play with the Silverado a little before it goes to its forever home and test out the new toys. 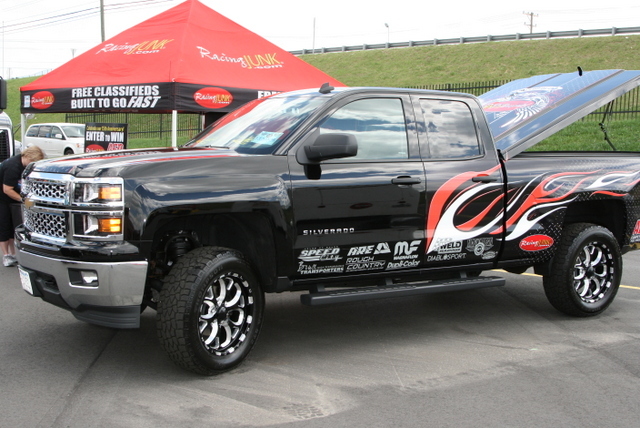 Currently, the 4×4 truck is touring the U.S., making stops at some of the most popular motorsports events in the industry, including the upcoming Hot Rod Power Tour. Since we don’t believe in trailer queens, the truck is a driven to each event by someone on staff, often by our very own Jim Sweener. When our staff, and the eventual winner, is on the road, we want to know that they’ve got the best tires underneath them. Which is why the truck is currently rocking a set of Mickey Thompson Baja STZ tires. The Baja STZs work particularly well on the Silverado thanks to their effective steering response, superior grip, and all-weather traction. They easily move between road and off-road, and were designed as an ideal entry-level, all-terrain tire. The tread design offers improved on and off-road traction, lug stability, self-cleaning capabilities, reduced stone retention and reliable response in a variety of conditions. As our resident truck expert, (Jim gets that title for having owned more trucks than anyone else on staff), we wanted his feedback on the all-terrain tires. Driving 13 hours straight from Massachusetts to North Carolina on the Baja STZs gave him plenty of time to contemplate them. Fortunately, they lived up to the hype. The truck handled very well, made minimal road noise, and the comfort and handling were noticeably better. Where most A/T tires inspire little confidence and generate excessive amounts of road noise at highway speed, the Baja STZs remain planted and quiet. And while we haven’t had a chance to take the Silverado off-roading, thus testing the all-terrainness of the Baja STZs thoroughly, Jim did climb a four-foot snowbank behind the RacingJunk offices in North Adams, MA “because it was there.” And as all truck enthusiasts know, that’s reason enough. Go HERE to learn more about the Mickey Thompson Baja STZ.